Hot Wheels Sky Shock RC Just $26! Down From $65! 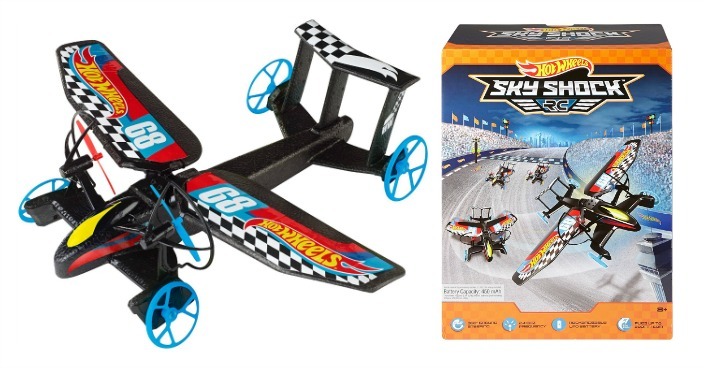 You are here: Home / Great Deals / Christmas Deals / Hot Wheels Sky Shock RC Just $26! Down From $65! Amazon has this Hot Wheels Sky Shock RC on sale for $26 (Reg. $65)! The ultimate on-ground racing vehicle that with the push of a button spreads its wings and takes off, climbing, soaring and stunting across the sky! In ground vehicle mode the remote controlled race car hurtles down the track breaking records and leaving the competition in the dust. The transformation is Epic! Large propellers and wings make climbing into the sky thrilling and easy to control.